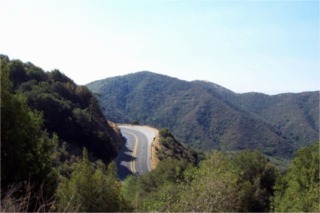 Rim of the World Scenic Byway starts on Route 138 near Mormon Rocks and Cajon Junction. 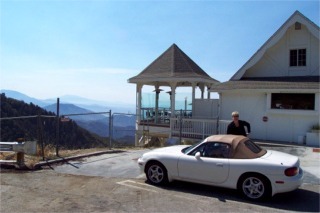 It goes up past Silverwood Lake, then picks up Highway 18. It continues on Highway 18 past Crestline and Snow Valley. From there it continues on Highway 38 on the north shore of Big Bear Lake. 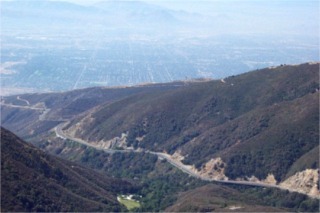 It travels through the San Bernardino National Forest. This is a photo of the road we took up to join the Rim of the World Highway. We didn't take it from the start. Ahhhh breathe in the air. For all of you who don't understand why California has such strict air pollution requirements here it is. The light tan colored stuff is not clouds, it is smog. 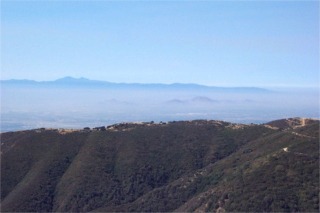 Down below that is San Bernardino and it always is covered in a layer of heavy smog. This is the Cliffhanger restaurant. We stopped here for brunch. Food was very good and the views were really fantastic. 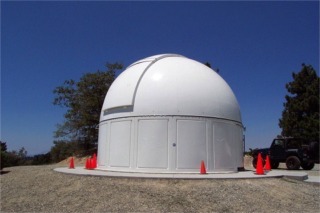 Mountain Skies Astronomical Society observatory. As we were driving along I saw a sign that said Astronomy Village. So I turned around and went back. There is this observatory and a building where they have a library. The young man there was happy to open it up and show us the observatory.